John, the son of Zebedee and Salome, and the brother of James the Greater, was a fisherman who fished with his brother and father in the lake of Genesareth. It is believed that he was, for a time, a disciple of John the Baptist, but was called by Jesus to be His disciple, together with James, Peter and Andrew. 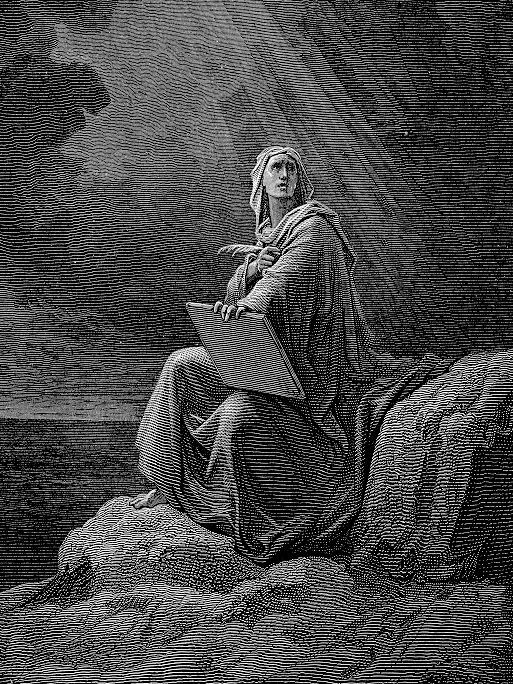 Picture left: St. John by Gustave Doré. At the Last Supper, he was seated next to Christ, on Whose breast he leaned. It is believed that he was the "other disciple" who, with Peter, followed Jesus after his arrest. John alone remained at the foot of the Cross on Calvary (John 19:25-27), and it was he who took Mary into his care after the crucifixion. After the Resurrection, John and Peter were the first disciples to hasten to the tomb (John 20:1-10), and it was John who was the first male disciple to believe in the risen Christ (v. 8). According to tradition, all of the Apostles died as martyrs except John. He was known as “the disciple whom Jesus loved” (John 13:23) and putative author of the Gospel that bears his name. He is also believed to be the author of the "Book of Revelation" and the 1st, 2nd, and 3rd Letters of John. His feast day is December 27. John's brother, James the Greater, is believed to have been the second martyr and the first Apostle who was martyred. The first martyr was St. Stephen whose feast day is December 26 (Hone); see also Hymns to St Stephen. For more information, see Leopold Fonck, St. John the Evangelist in The Catholic Encyclopedia, Volume 8 (1910), http://www.newadvent.org/cathen/08492a.htm . Death cannot finish life never ending. Loving in peace and joy one another. Rock of refuge, the Rock of Ages. Heaven shall pass away with a noise. Only all saints abide with their Jesus. That we in Thee may abide together. See: Christmastide Poems of Christina Rossetti. From the Gospel of John, Chapter 21, Verse 22. My soul, -- Thy love can never change. See: Christmas Poetry of Catherine Winkworth. Others poem to St. John can be found in Christmas-tide Poetry of John Keble and On Saint John's Day - Anonymous. See also: December 27 - St. John (Hone). Christian Classics Ethereal Library: Fox's Book of Martyrs, http://www.ccel.org/f/foxe/martyrs/fox101.htm . Other sources give the surname as Foxe. All sites accessed April 2, 2006. All links open in a new window at an external site.